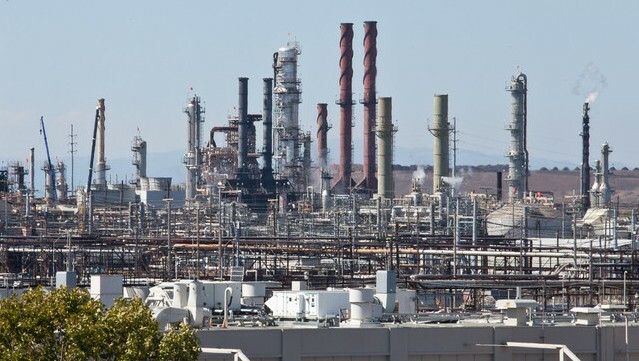 The Richmond City Council is slated to decide in one week whether to give final approval to Chevron's plans for a $1 billion project at its refinery there. The council is now considering what conditions to place on the project, if it's approved. A hearing Tuesday night drew about 500 people; nearly 200 signed up to speak during the public comment period, both for and against the project. "They come to us with plans to modernize only a part of their operation that will allow much dirtier sources of crude oil to be processed," said Richmond resident Robert Bishop, "and to make millions and millions of dollars more profit each year by doing so." One of the goals of the project is to allow Chevron to refine crude with a higher sulfur content. The industry calls this "sour" crude; environmental groups call it "dirty" crude. Bishop said the project shouldn't get the green light unless the council imposes the stricter conditions recommended by the city's Planning Commission. Environmental groups suggested those conditions and Chevron is appealing them. The oil company has, however, agreed to a plan submitted by Attorney General Kamala Harris, and included in the EIR as Alternative 11. That alternative, unlike Chevron's original proposal, would reduce how much sulfur the refinery could process, and would not increase greenhouse gas emissions. Chevron's preferred plan would have allowed an increase in greenhouse gas emissions to be offset by carbon credits. The company has also agreed to double community investment dollars over the next decade, to $60 million. That would benefit all Richmond residents, said Chevron employee Suzanne Jackson. "A cleaner, newer, safer refinery will continue to support the bridge of the gap between social and economic change here in Richmond," she said. Earlier this month, Richmond's planning commission approved the environmental impact report for the project, recommending the city council approve Alternative 11. "This was a good project before, it's a really great project now, so we're very hopeful," said Chevron spokeswoman Melissa Ritchie. "Greenhouse gas emissions will not increase as result of project, they will actually decrease." The planning commission also set forth a series of conditions proposed by environmental groups, and Chevron has appealed all of them. One condition would require stricter pollution emission standards, the second would require a more thorough upgrade of parts of the refinery that handle highly corrosive high-sulfur crude oil, and the third would require the company to participate in “climate justice mitigation,” reportedly including a clean-energy jobs program. Staff for the city council oppose those conditions, saying they are outside the scope of the EIR, or outside the jurisdiction of the city. Without those additional conditions, Andrés Soto from CBE says he's concerned Chevron's lower emissions goals would be unenforceable. "It just doesn't have any teeth in it," Soto said, of the possibility of adopting the lower-emissions scheme without the additional conditions. "We think not only would it be the wrong decision, we think it would be legally challengeable." If so, this would not be the first time Chevron's refinery project went to the courts. The project, called a modernization by the company and an expansion by its detractors, is a scaled-down version of an earlier proposal. That one was approved both by the Richmond planning commission and the city council in 2008, before environmental groups including Communities for a Better Environment successfully sued to stop it. The city council plans to decide on the fate of the project at a meeting next week.